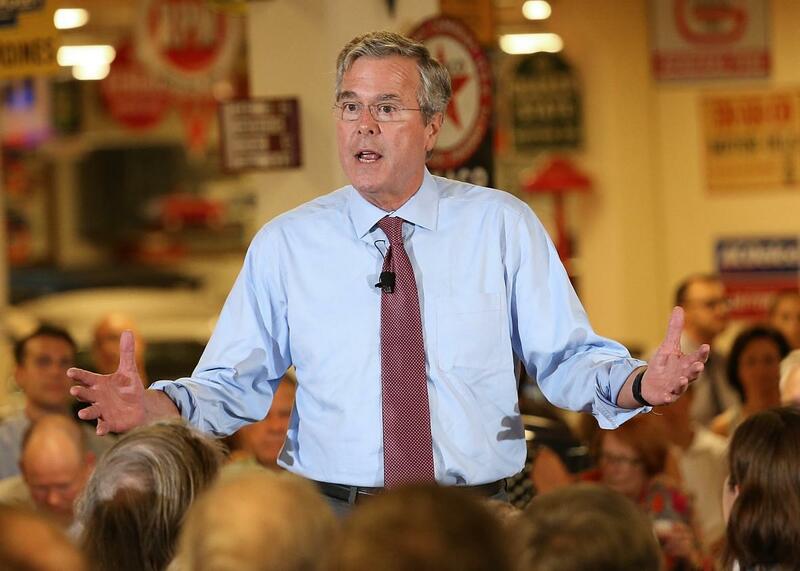 Jeb Bush speaks at Dennis Albaugh’s Classic Car Barn during the Polk County GOP Annual Summer Sizzle event on August 13, 2015 in Ankeny, Iowa. Jeb Bush got himself in some hot water last week for unapologetically using the term “anchor babies” in response to a question about birthright citizenship. On Monday, the one-time Republican frontrunner somehow managed to make things even worse. Asked at a Texas campaign event whether he was afraid using the derogatory term would alienate Hispanic voters, Jeb explained that he was not. His reason? He was really talking about Asians when he deployed the term last week. As I explained last week, Bush’s defiant use of such inflammatory slang was so striking in the moment because, in a GOP nominating contest currently dominated by anti-immigrant belligerence, Jeb has tried to present himself as the levelheaded, compassionate adult. Meanwhile, the Hispanic Leadership Network, a center-right group that he helped found and remains connected with, was already on the record urging politicians not to use the term. The fact that Bush used it while defending birthright citizenship only made things even more bizarre. Bush’s latest immigration-themed stumble illustrates a larger point that my colleague Jamelle Bouie made last week: The GOP’s current Donald Trump-led immigration debate won’t just cost its eventual nominee with Hispanic voters—it’s also likely to turn off other immigrant communities as well, particularly Asian Americans. “This rhetoric matters to them too,” Jamelle wrote. Thanks to Bush, they’ll no longer have to read between the lines.